Prime Minister talks with global corporations. Photo: VGP / Quang Hieu. At the talk with 20 global corporations including Standard Chartered, Google, Facebook, Apple, Bloomberg, GE, Hitachi, Temasek, ThaiBev ... and some big corporations in the country, The World of ASEAN (WEF ASEAN 2018), Prime Minister Nguyen Xuan Phuc opens with a series of questions. "Who will help investors who are planning to invest in Vietnam from $ 500 million to $ 1 billion in the next 3-5 years?" What investors need the Government of Vietnam to support? Investing in Vietnam, who is willing to expand investment? Investors are willing to expand investment or not? What government should adjust to make investors quickly implement this plan? he said. Share your desire to listen to "what do you most like and what do you think is most distressing when investing in Vietnam? ", The head of government affirmed, the Government, the Ministries, sectors, localities of Vietnam will have solutions to solve problems. "In addition to capital, you have a breakthrough idea for Vietnam in the short term and not? In any industry, industry, education, health care, insurance, agriculture ... not just capital, we want to hear your ideas for Vietnam's development. You are the best new entrepreneur most successful, "the prime minister questioned. At the meeting, Judge Hsu, Managing Director of ASEAN and South Asia, Standard Chartered Group said that after 15 years of presence in Vietnam, the bank pledged to continue to promote strong cooperation. This is especially true when the State Bank of Vietnam recently approved the Bank to open its fourth branch last year in Ho Chi Minh City. Simon Milner, Facebook's Vice President, Public Policy for Asia and the Pacific, is committed to long-term presence in Vietnam and wants to join the government's vision of digital nation, Enter into four areas: population, digital economy, digital government and digital connections. Mr. Simon Milner is also committed to working with Vietnamese businesses, especially support, cooperation with small and medium enterprises, start-ups. Meanwhile, the leader of Thai Beverage Group (Thaibev) said that last year invested about $ 5 billion to buy Sabeco shares and committed to develop Sabeco brand to the world, promoting both Vietnamese culture. foreign. Alex Dimitrief, President & CEO, Global Growth Organization, GE Group, said, "Vietnam is becoming one of GE's most successful global stories. "The Group is very successful in Vietnam and we look forward to celebrating 125 years in Vietnam," he said. A representative from Hitachi, Yasuo Tanabe, senior vice president, said that it would be more involved in the Internet connection for the manufacturing industry. 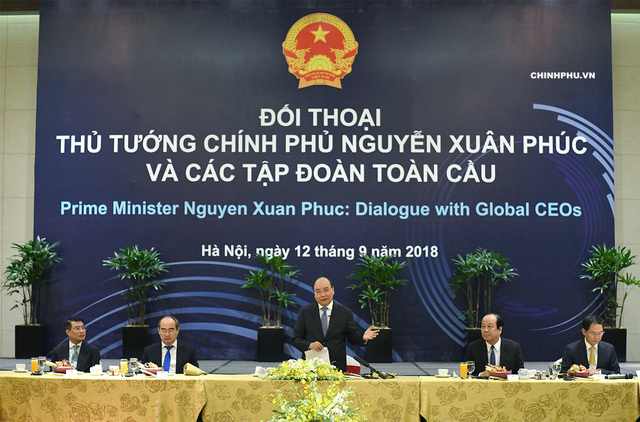 At the same time, the Government of Vietnam wants to create a open and open trade environment.